This game helps a child to learning and practice identifying words with specific letter sounds and sound-spellings. It is related to phonemic awareness, i.e. to hear and identify individual sounds-phonemes–in spoken words. With this game children can become more aware of how the sounds in words work. Children are called to recognize which words in a set of words start or contain a specific phoneme sound as well as to identify words that rhyme to a given one. The teacher can choose the sounds (e.g. specific consonant or specific long/short vowel) that the child will practice. The child listens to that sound, recognizes the letter and selects the word(s) that begin with or contain that letter and sound. Kids easily improve their letter identification and phonemic awareness skills as well as sharpen their memory skills. Children can understand that letters and letter patterns represent the sounds of spoken language. The teacher can also ask a child will practice identifying rhyming word(s) to a given one. Also, this game promotes visual motor perception. 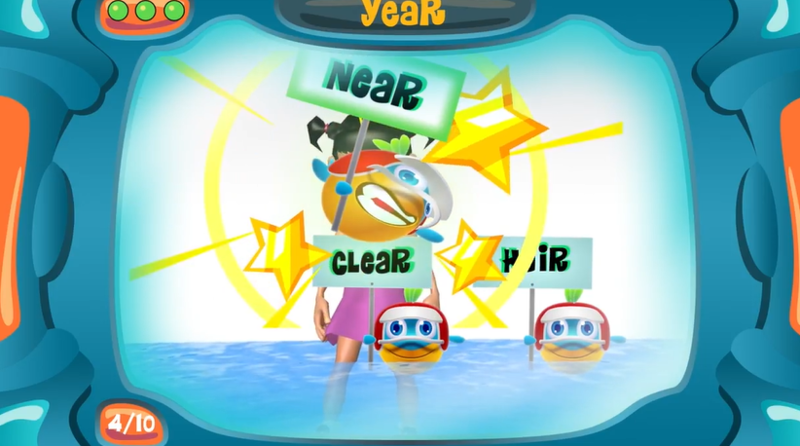 The child appears in a room filled with water and there are 3 options of words that can be chosen by either hitting with the hands or kicking.